During a particularly sad time in our life, while visiting Duke University Medical Center, daily strolls were a required thing to do. To keep things from overwhelming us, we would take these long walks around the parks in the area for fresh air and to hear the sights and sounds of life. Some of the gardens were something out of a dream with flowers, ponds, and ducks. One of the other joys were the smells. 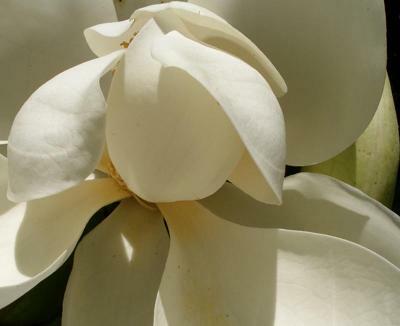 A rather fragrant scent that was really sweet could be found close to one of the south's favorite trees, the magnolia. Here is a photo and hopefully the link for the subsequent painting from that photo. The creamy white of the pedals, and contrasting dark green leaves give this a high score on my list of beautiful trees. One of the most difficult things to achieve with this piece were the microscopic glitter that is all over these blossoms. I see them on orchids too, when in direct sunlight, there is a shimmer and sparkle that the camera rarely captures. Sort of like the vampires skin in "Twilight" and "New Moon" movies when they walk out into direct sunlight! Maybe this is where the writers got their idea! 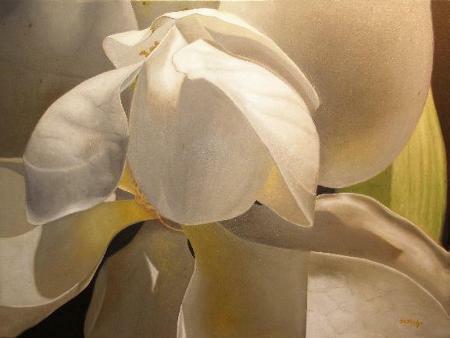 Your magnolia is beautiful, and the shimmer on the petal so true! The beauty and appreciation of nature during difficult times is a respite. Your words touched me so, and I hope that things are the best they can be for you and your family.